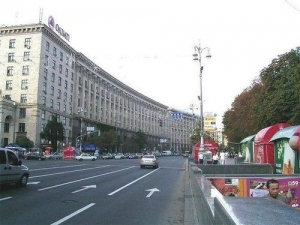 Kreschatik is the most famous and one of the busiest streets in Kiev. It is a wide boulevard with plenty of chestnut trees. It is hard to believe that some time ago on the site of Kreschatik used to be a valley and a river surrounded by forest. The valley was called Kreshataya (Crossed) because it was intersected by many ravines. It was one of the favorite hunting places of Kiev princes. There is a version, according to which Kreschatik was called so in honor of Russia's baptizing («krest» means «cross» in Russian), but it is not reliable enough. Along the bank of the river through the valley an important trade route passed. In the end of the 18th century the first construction appeared on the right side of the road. Gradually left side of the road was also built up with dwelling houses, and in 1805 the first Kiev Theater appeared in the street. Nowadays on the site of the theater the Ukrainian House is situated. Kreschatik got its final modern shape in 1837. It stretches from European Square till Bessarabia Square and contains many important trade buildings, bank departments, luxurious restaurants, hotels and exchange house. The architectural look of the Kreschatik Street was changing gradually. For a long time beautiful stone buildings adjoined haulm-roofed houses and clay-walled huts. In the puddles one could see pigs, and it was impossible to cross Kreschatik without special devices, such as stilts. There were people called bosyaki, or tramps, who took money for carrying people from one side of Kreschatik to another. The situation changed after canalization system installation. The street was paved with granite cubes and became elegant and fashionable. By the end of the 19th century Kreschatik became the main Kiev thoroughfare. It was the place where the venues famous all over the country, such as Semadeni confectionary and Tarasova's dairy were located. The popular stores and restaurants turned into sources of the freshest news, as their owners received English, Belgium, German, French, Petersburg and Moscow newspapers and magazines two or three days earlier than the rest of the city. Nice buildings and refined street lamps, monuments to Alexander the Liberator and Stolipin made Kreschatik a very charming street. The first tram in the country went along Kreschatik Street. The fate of Kreschatik during the World War I and the World War II was tragic: the street was badly damaged and destroyed. In 1943, immediately after Kiev liberation, reconstruction works on Kreschatik started. After the works were finished, the street became «higher and wider» than it used to be. Today its buildings perfectly harmonize with surrounding landscape, and Kreschatik impresses as a single whole. Nowadays Kreschatik ranges among the major attractions of Kiev. The citizens of the city adore this street, and the guests of Kiev try to visit it and feel its charming atmosphere first of all. Such Kreschatik buildings as Kiev City Council, Central Department Store, National Philharmonic, as well as other administrative constructions, stores, hotels and metro stations deserve special attention of Kiev guests.